Is there anyone in the world who has never had a headache? In some cases, we can solve this pesky problem by ourselves, yet sometimes we should see a doctor immediately. With this in mind, the experts at Michigan Spine and Pain have put together a quick reference guide to help you identify the type of headache you have and the best strategy for pain relief. This is the most frequent type of headache in the world: everyone has experienced it at least once in their life. Symptoms: Usually, this is a mild non-throbbing pain. Tension headaches often cause a pressure sensation that feels like you’re wearing a tight band around your forehead. Most often, the intensity of the pain increases from morning to evening. CAUSES: Factors that seem to contribute to tension headaches are severe stress, fatigue, poor posture, and holding the head in an improper position for a long time. 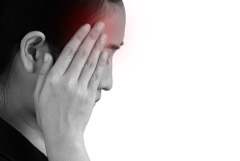 Chronic tension headaches are rare and are often associated with head or neck injuries. TREATMENT: There are many over the counter medications that effectively mitigate a tension headache. However, this should only be used occasionally. If headaches occur frequently and last for a long time, consult your doctor. Also, try to be physically active, stretch your shoulders and neck regularly, and spend more time outdoors. This type of headache is caused by sinusitis. 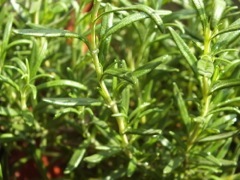 It is often accompanied by fever, facial swelling, and tension in the forehead and cheekbones. SYMPTOMS: Typically, you’ll feel a deep pressure, and pain in your forehead in the area of the eyebrows and under the eyes. The pain usually gets stronger when you move your head sharply. You may also have a running or blocked nose and feel tired. CAUSES: Sinus headaches are caused by sinusitis. 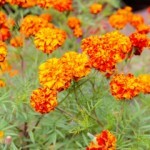 They are also a common complication after having a cold or are the result of a seasonal allergy. TREATMENT: Sinus headaches rarely go away on their own. If you have an allergy, antihistamines may help. In other cases it’s best to see a doctor who will most probably prescribe antibiotics, if you have a sinus infection. All symptoms of this severe headache occur during a migraine attack that progresses through four main stages. Different people report various symptoms of these headaches. Not all migraines are experienced identically. CAUSES: A migraine is often associated with a violation of the metabolic processes and dilation of blood vessels in the brain. A person also may inherit a genetic predisposition for developing migraines. TREATMENT: There’s currently no cure for migraines, although a number of treatments are available to help ease the symptoms. You need to see your doctor to choose the right medication. Moreover, regular exercise will help you improve your health significantly. Cluster headaches are rare, affecting less than 1 percent of the population. They are five times more common in males than females. SYMPTOMS: A cluster headache may cause a stabbing pain behind or around your eyes, usually on one side of your head. It frequently develops during sleep. Symptoms may also include redness of the eyes, sensitivity to light and eye tearing. The pain usually lasts from 15 minutes to 1 hour. CAUSES: Scientists don’t know exactly what causes cluster headaches. They are most often linked to disruptions in the body’s biological clock. TREATMENT: Treating a cluster headache can be tricky because the pain appears and disappears spontaneously and at a moment’s notice. Only a doctor can help you solve this problem. CAUSES: We hear many different versions about why people often have a headache after drinking alcohol. One of them suggests that alcohol causes blood vessel dilation and affects serotonin levels in the body. Moreover, alcohol promotes water loss and dehydration — major migraine triggers. TREATMENT: The best remedy is to take an over the counter headache medication, drink plenty of water and get some good sleep. You should take a hangover seriously. If you have a headache after consuming even a small amount of alcohol it may indicate that you’re suffering from a mild form of migraine. Can Acupuncture Offer Pain Relief and Reduce Opioid Use? A new study will seek to determine whether access to acupuncture as a pain management tool for chronic pain could help prevent patients from becoming addicted to opioids. The state of Vermont is seeking to answer that question by funding a study to see if making acupuncture accessibly to Medicaid patients could be useful in treating chronic pain, as a way to avoid or reduce reliance on opioid medicines and is both feasible — and useful. Since acupuncture is increasingly considered a viable option for pain relief, Vermont legislators have made clear that they want to explore how it could impact the lives of others — particularly those living below the poverty line. Robert Davis, a neuroscience professor at the University of Vermont Larner School of Medicine, is running the study. During the three-month study, different acupuncturists in three different Vermont cities will offer free sessions to qualifying Medicaid patients with chronic pain. Davis acknowledged in an interview with Vermont’s National Public Radio that people who often seek out acupuncture are those who can afford it, but he says it often doesn’t mesh with the larger trend toward including non-pharmaceutical options for treating pain and other illnesses. While not without controversy, there is growing evidence that acupuncture can be effective for some types of pain relief. In 2010, 93 percent of deaths from opioids in Vermont involved overdosing on prescription medicine, according to the state’s Department of Health. That percent has since decreased as use of heroine has risen. But misuse of prescription opioids continues to be a problem. Addiction issues stemming from prescription medicines are still a significant part of the opioid epidemic. The Legislature-funded study is looking to see if acupuncture could provide an alternative, or a complement, to prescription opioids. It isn’t evaluating the science of acupuncture; there won’t be any comparing its effectiveness to a placebo — and there’s already evidence it can provide pain relief. Instead, the research project is set up to see just how feasible it would be for Medicaid patients to use acupuncture. And what impact it might make on their lives. “One of the things that we’ll learn from this study is: Will these people utilize acupuncture if offered?” Davis asked in the interview. The study will also measure if people’s pain was reduced, and will look at a whole range of health measures, from the ability to do daily activities to the patient’s psychological status to whether his or her use of painkillers decreases. The study is even measuring how acupuncture might impact the patient’s use of other health services. “In other words, we’re interested to see: Did it affect the amount of times that people went to the emergency room? Did it affect how often they went to doctor, or filled prescriptions, or things like that?” Davis asked. 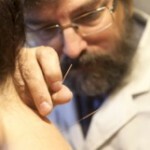 If early indications hold any weight, there’s certainly interest in acupuncture among people suffering chronic pain. The trial just began soliciting volunteers a few weeks ago, and already 75 people have been processed and enrolled, according to Vermont NPR. The study will continue through April 2017 and the results will be submitted to the Vermont legislature later this spring. As with other types of chronic pain, women tend to experience hip pain more often than men. Yet, hip pain can have a number of different causes and determining the correct one is the key to getting the best treatment. When you tell your doctor your hip hurts, the first thing he should do is confirm that your hip is actually the problem. Women might say they have hip pain, but what they may mean is they’re having pain in the side of the upper thigh or upper buttock, or they may be experiencing lower back pain. Hip pain is often felt in the groin or on the outside of the hip, directly over where the hip joint (a ball-and-socket joint) is located. When a female patient comes to Michigan Spine and Pain complaining of hip pain, our clinicians and physiatrists consider the patient’s age, build and activity level. Depending on the patient’s weight, general physical fitness and health as well as age and other factors, the possibilities will be different. The most common cause of chronic hip pain in women is arthritis, particularly osteoarthritis — the wear-and-tear kind that affects many people as they age. The ball-and-socket joint starts to wear out. Arthritis pain is often felt in the front of your thigh or in the groin, due to stiffness or swelling in the joint. Hip fractures are common in older women, especially those with osteoporosis (decreased bone density). Symptoms of a hip fracture include pain when you straighten, lift or stand on your leg. Also, the toes on your injured side will appear to turn out, a sign that can aid our preliminary diagnosis. Many tendons around the hip connect the muscles to the joint. These tendons can easily become inflamed if you overuse them or participate in strenuous activities. One of the most common causes of tendinitis at the hip joint, especially in runners, is iliotibial band syndrome — the iliotibial band is the thick span of tissue that runs from the outer rim of your pelvis to the outside of your knee. In the groin area, femoral and inguinal hernias — sometimes referred to as sports hernias — can cause anterior (frontal) hip pain in women. Pregnant women can be susceptible to inguinal hernias because of the added pressure on the wall of their abdomen. Treatment for hip pain depends on the diagnosis, but pain caused by overuse or sports injury is often treated with heat, rest and over-the-counter anti-inflammatory medication. To prevent injuries, it’s important to stretch before exercising and wear appropriate clothing, especially good shoes when running. Some causes of hip pain, such as fractures or hernias, may need surgical repairs. If your hip pain persists, come in and let’s discuss the possible causes and treatment options. When to Choose a Physiatrist? The practices of physiatrists and other practitioners, such as chiropractors, may be similar in scope but their differences should factor into a patient’s decision on which professional to visit. The severity of the condition for which a patient is seeking treatment, being of paramount importance. Physiatry is a branch of medicine that deals with the prevention, diagnosis and treatment of disease or injury ¾ and the rehabilitation of resultant impairments and disabilities ¾ using physical and sometimes pharmaceutical agents. At Michigan Spine and Pain, we believe strongly in the usefulness of chiropractic medicine, which is why chiropractors have a significant role in our practice. However, we do not believe in chiropractic medicine in a vacuum. Physiatry, by its nature, involves more medical investigation and lab work to find the cause of pain. Physiatrists can achieve a lot of physical progress without the need to go under the knife. One of the most significant differences is that a physiatrist can prescribe pain medication and typically has better access to lab and advanced imaging testing. At its most basic level, chiropractic medicine is designed to adjust the spine and to reduce or remove subluxations (misalignment) of the spine. Working on stress management and diet, in addition to pain management can be big factors in addressing back pain health. A physiatrist’s practice will work on those issues, because that is part and parcel of the subspecialty, which all affects the impact of treatment on the patient. In our practice, the physiatrist works with the chiropractor, so that the patient receives the best of all available treatments. Physiatry is a whole body approach and the overall outcome will be better in the long run. Of course, if the issues are severe enough that non-surgical techniques are ineffective, a physiatrist, being a medical doctor, has the network of colleagues in other subspecialties to make specific referrals. In the end, it is about achieving the best outcome for the patient. The scientific research, however, isn’t as effusive as the marketing copy on the back of the bottles. 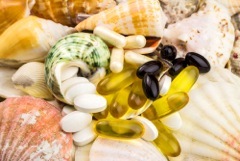 Here, we look at the evidence for when these supplements might help — and other pain management strategies to consider. Research suggests that high doses of fish oil, or other sources of omega-3 fatty acids, may help for one particular type of joint pain: rheumatoid arthritis. 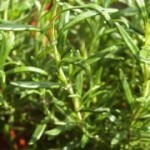 But its effect on most other types of joint pain, including osteoarthritis, is unclear. For example, Consumer Reports cited analysis in The Journal of Pain that looked at 17 randomized controlled clinical trials which concluded that people with rheumatoid arthritis who took 1.7 to 9.6 grams of fish oil a day reported less joint pain, tenderness and stiffness. The investigation also found that people who took more than 2.7 g per day reported a greater improvement in morning stiffness and painful or tender joints than those who took lower doses. A 2010 trial of 662 people with knee osteoarthritis published in the Annals of the Rheumatic Diseases did find that these supplements relieved pain for some people — but over time were no more effective than a placebo. More recently, a study of 1,625 people published in the journal Arthritis & Rheumatology in 2015 found that using glucosamine and chondroitin over a four year period did not relieve knee pain or prevent cartilage loss in people with osteoarthritis any better than a placebo. In addition, The American Academy of Orthopaedic Surgeons does not recommend either of these supplements for osteoarthritis of the knee. One step is to lose weight. Research suggests that for every pound of excess weight you shed, it can take approximately 4 lbs. 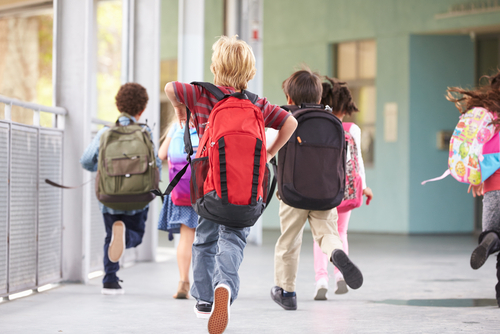 of pressure off the knees when walking. Additionally, strength training can help build up the muscles that support the affected joint. As well, gentle, low-impact exercise such as swimming and walking can relieve dull knee pain by keeping the joints flexible and lubricated. And, for flare-ups, try over-the-counter anti-inflammatory medications like ibuprofen or naproxen, if your medical provider agrees that this is safe and recommended for you. If you are experiencing joint pain, we suggest a thorough for proper diagnosis. To schedule an appointment, contact Michigan Spine and Pain online or by calling (800) 586-7992. Specific symptoms: What are the main symptoms associated with your pain (e.g. popping noises, locking, etc.)? Location of the pain: where exactly is your knee pain (e.g. inner our outer knee)? How did the pain start: the mechanism of injury (e.g. sudden twisting or gradual onset)? One of the most important parts of diagnosing knee pain is thinking about the specific symptoms that accompany the pain. These tend to be the most defining features in knee pain diagnosis, as the presence or absence of them quickly rule conditions/injuries in or out. A sudden popping noise at the time of injury usually indicates a ligament injury or sometimes indicates a cartilage tear. Persistent clicking/grinding when the knee moves may indicate an ongoing knee problem affecting the joint surfaces or how the bones are moving such as chondromalacia patella. This happens when something gets wedged in the joint, stopping you from moving the knee. You generally have to wiggle the knee around before it will then move. The most common cause of locking is a Meniscus Tear (a tear in the cartilage that lines the joint.) It can be caused by sudden twisting or a force through the knee, or can come on gradually due to wear and tear. A less common cause of locking is Osteochondritis Dissecans, a condition where poor blood supply causes small bits of bone and cartilage to break off at the joint. Knee pain from running is hardly surprising when forces up to 550% of one’s body weight go through the joint when running. Running knee pain is usually due to either training errors or poor biomechanics. This is when the knee buckles underneath you without you being able to control it. The most common cause of this is a ligament injury, usually an ACL tear or sometimes a PCL injury. They are usually caused by sudden twisting, a force through the knee or the knee bending backwards the wrong way. Only 20% of ACL tears are caused by direct contact. It may be accompanied by a popping sound, swelling and extreme pain. 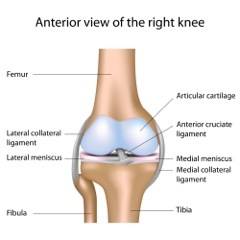 Meniscus tears often make the knee feel unstable and can occasionally cause the knee to give way, but this is much less common. A great deal of force goes through the knee when we do any activities with a bent knee. For example, squatting down places a force seven times body weight through the knee. It may be caused by a problem inside the knee, such as a cartilage tear or arthritis, or one of the surrounding structures, such as a ligament tear or inflammation of the bursa. This usually indicates a problem with the kneecap, as the force going through the kneecap when you come down stairs is 3.5 times bodyweight. If the swelling begins immediately or within the first 48 hours, it usually indicates a ligament or cartilage injury. If it comes on gradually with no specific cause, it usually indicates an underlying knee problem such as bursitis. If there is moderate to severe swelling, you should see your doctor immediately. 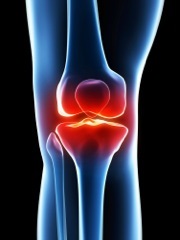 Knee stiffness may develop as a result of an injury or a medical condition. It may develop suddenly or gradually, and often fluctuates. Stiffness when you first wake up that settles once you’re moving about is a classic feature of Osteoarthritis, which is most common in people over age 50. This is a classic sign of Osgood Schlatters, which is common in teenagers and young adults, particularly after a growth spurt. Tension on the tendon just below the kneecap damages the bone, often resulting in a hard lump on the front of the shin. Remember, the best way to get an accurate knee pain diagnosis is to see your doctor. 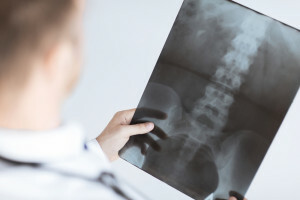 Contact Michigan Spine and Pain for an appointment to receive a proper diagnosis.